THE MATERIALS CONTAINED HEREIN ARE INTENDED TO BE AN INFORMATIVE AND EDUCATIONAL LEGAL REFERENCE SOURCE FOR LAW STUDENTS, NEW ATTORNEYS, LEGAL PROFESSIONALS AND OTHERS INTERESTED IN LEARNING MORE ABOUT THE LEGAL SYSTEM IN NORTH CAROLINA. ONE WOULD BE WELL-SERVED TO UTILIZE THIS INFORMATION AS A STARTING POINT IN UNDERSTANDING THE OFTEN TIMES CONFUSING AND COMPLEX LEGAL SYSTEM IN NORTH CAROLINA. LAWS CHANGE, THEREFORE MAKE CERTAIN TO REVIEW THE STATUS OF AMENDMENTS. SEE LINK BELOW TO THE NORTH CAROLINA GENERAL ASSEMBLY WEBSITE. How have cultural changes in North Carolina affected legal representation and the attorney-client relationship in NC DWI cases? In a generation defined by self-realization, can Charlotte DWI lawyers effectively explain a complicated and sometimes inequitable legal system? The logic goes like this: With the ease of “not driving” in places like Raleigh, Greensboro, and Asheville, and even Wilmington NC, there is absolutely no reason for DWI in Charlotte NC. The disconnect between personal actions and accountability merits discussion among legal professionals. It seems likely that “disconnect” is ingrained in, if not an endemic part of, our cultural and societal norms in the United States of America. Put simply, people charged with DWI rarely fully comprehend the true nature and extent of their own behavior(s) related to an arrest. One would be remiss in failing to note that there are substantial differences to criminal laws and public policy concerns regarding DWI-DUI even between our two closest international neighbors, those being Canada and Mexico. Canada’s DWI laws are downright progressive compared to the North Carolina DWI laws. And yet, allegations of driving while impaired in Canada are dealt with in a swift, decisive, and to some, harsh fashion. Legal protections or “rights” like Probable Cause to Arrest and Miranda Warnings are largely inapplicable. And while Canada might apply retributive-type action at lightning speed, including “booting” the vehicle used during the offense, immediate suspension of the driver’s license or operators privilege, and mandatory alcohol assessment and treatment, actions are civil, administrative in nature, and viewed in the community as part of a restorative process. The anecdotal commentary on Mexican DWI laws is that they, the driving while impaired laws, are nearly the exact opposite and so laxly applied as to be essentially non-existent. Clearly that thought process could easily be construed as more than a bit xenocentric. It would be a mistake in failing to note countries other than the United States who punish people convicted of DWI-DUI charges based on the harm actually committed, as opposed to the potential for harm or damages that may have, but didn’t, occur. Punishments for driving while impaired may be quite severe in instances where a death results from “drunk driving,” even in places where day-in-day-out enforcement is less proactive. Criminal defense lawyers in Charlotte NC and other jurisdictions in North Carolina are therefore relegated to trying to explain a sometimes inexplicable legal system. That’s in addition to addressing the complexities of calendaring court appearances and explaining the long-lasting aspects of the DWI conviction. I am a good person. I don’t believe in drunk driving. How am I supposed to work or take care of my family with no license? Why are they throwing the book at me, when there are murderers out there? I work hard, pay my taxes, go to church, and contribute to society, so what good will it do to put me in jail? The concept of a “permanent record” is foreign to many. How often, as a defense attorney, have you dealt with the assumption that even the most serious of felony criminal charges in NC can be expunged? Even low-level or “first offense DUI” violations of N.C.G.S. 20-138.1 are assumed eligible for reduction as a “reckless driving” or “wet reckless” charge and eventual expunction. Under the North Carolina DWI laws, nothing could be less likely or further from the truth. Experienced defense lawyers lament the current status of the DWI laws, fully admitting that things likely will “only get worse.” The second half of that common tome, “before they get better,” is truncated for good reason. No one with any level of intellectual honesty toward the DWI laws in NC expects them to get better. . .ever. That may be for good reason. DWI in Charlotte NC and impaired driving charges in North Carolina as a whole are no longer acceptable, excused, or varnished over by society, even by those accused of DUI charges in NC. 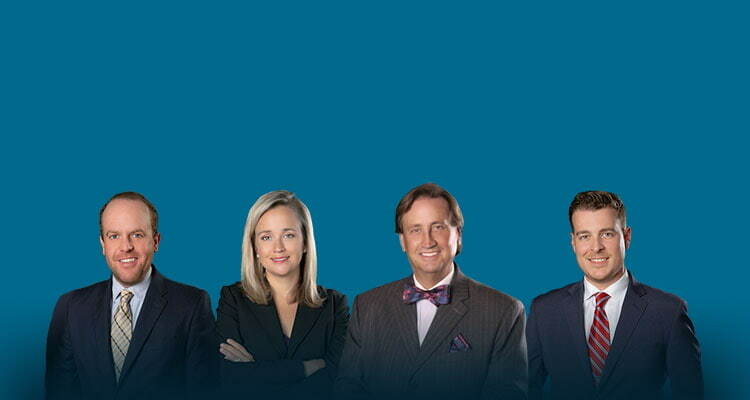 Bill Powers, Criminal Defense Lawyer Charlotte NC is available for consultation and public speaking engagements. (a1) A person who has submitted to a chemical analysis of a blood sample, pursuant to G.S. 20-139.1(d), may use the result in rebuttal as evidence that the person did not have, at a relevant time after driving, an alcohol concentration of 0.08 or more. (b) Defense Precluded. - The fact that a person charged with violating this section is or has been legally entitled to use alcohol or a drug is not a defense to a charge under this section. (b1) Defense Allowed. - Nothing in this section shall preclude a person from asserting that a chemical analys is result is inadmissible pursuant to G.S. 20-139.1(b2). (c) Pleading. - In any prosecution for impaired driving, the pleading is sufficient if it states the time and place of the alleged offense in the usual form and charges that the defendant drove a vehicle on a highway or public vehicular area while subject to an impairing substance. (d) Sentencing Hearing and Punishment. 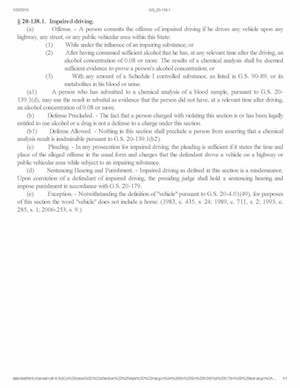 - Impaired driving as defined in this section is a misdemeanor. Upon conviction of a defendant of impaired driving, the presiding judge shall hold a sentencing hearing and impose punishment in accordance with G.S. 20-179.